Frogs and other amphibians lived through several mass extinctions on Earth over the past 250 million years, surviving the dinosaur wipeout and the most recent Ice Age. But now, say scientists this week in the Proceedings of the National Academy of Sciences, all that is changing. Amphibians are going extinct in such huge numbers that we've entered nothing short of a new mass extinction event. It's the sixth such event in known Earth history. At least one-third of amphibian species are threatened with extinction right now, and even non-threatened species are suffering catastrophic declines in population. 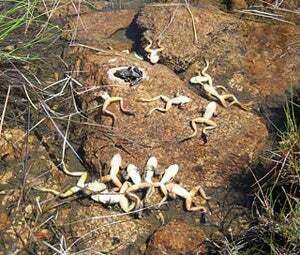 Most likely, the causes are global warming and the shrinking habitats where amphibians live. "There's no question that we are in a mass extinction spasm right now," said David Wake, professor of integrative biology at UC Berkeley . . . New species arise and old species die off all the time, but sometimes the extinction numbers far outweigh the emergence of new species. Extreme cases of this are called mass extinction events, and there have been only five in our planet's history, until now. The sixth mass extinction event, which Wake and others argue is happening currently, is different from the past events. "My feeling is that behind all this lies the heavy hand of Homo sapiens," Wake said. It's hard to say exactly when the mass extinction of amphibians began. It could have been 10,000 years ago, when humans arrived in the Americas and began changing the local environment by hunting. Or it could have been with the dawning of the industrial area, with its chemical pollutants destroying watery environments where frogs live. No matter when the extinction began, Wake and his colleagues believe that it has sped up considerably over the past few decades and shows no sign of slowing down.